I work with many accomplished authors, but it is truly a special event when a novel of this calibre lands on my desk. From the opening pages and the crack of the cricket bat, I knew I was going to be completely transported into another world. The beloved author of over thirty bestselling books, including two ongoing mystery series, Rhys Bowen penned this fabulous stand-alone historical novel that kept me up late turning the pages. Both a glimpse into the Downton-esque family life on a British estate called Farleigh Place and a World War II mystery, this book is full of vivid characters and situations that immerse you in the lives of the aristocracy. Each of the daughters of Lord Westerham, who grew up in this rarefied world, is deeply affected when a dead parachutist—likely a spy—is found in the grounds. Everyone, including family and staff, comes under suspicion as someone who might have colluded with the unknown military figure. Ben Cresswell, the son of the town’s vicar and a close friend of the Westerhams, becomes our unlikely hero when he is called up by MI5 to use his connections to investigate. Ben ultimately risks his life and everything he loves as he works to find the truth, all the while knowing that many more lives are at stake. 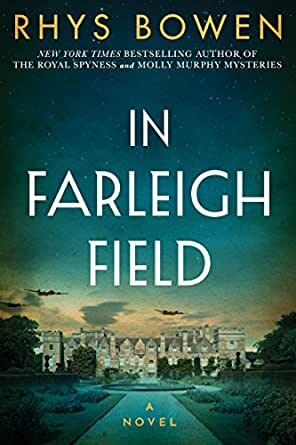 At its heart, In Farleigh Field is a tale of a family and a formerly quiet British village that must endure and thrive in a world torn by conflict. As an avid fan of novels of this ilk, as well as of Rhys Bowen, I know you will join me in applauding this book, which is truly one of her very finest. When war gets personal, every heart is in peril. An irresistible, charming and compelling tale of loss, honour and love. Ms Bowen certainly knows how to tell a good story. She has thoroughly researched her material, and chosen a familiar setting which immediately makes the reader feel at home. Having said that the time and the place are completely removed from most people's experience, which is why we appreciate writers bringing them to life. The events of war-torn Europe are rich pickings for authors however events alone won't carry a novel. Ms Bowen weaves numerous threads in this interesting story, keeping us guessing until the very end. I must confess however, that I guessed the villain. It wasn't so difficult. The characters were somewhat stereotyped, but then I guess they probably were in real life too. Some of them are very endearing; the author has a real flair for bringing her characters to life. I will miss this book. This is a good spy novel. There were plenty of suspects and plenty of red herrings. And the characterisations were believable. Bowen gave just enough clues to point the reader towards the true villain. I was surprised by their accomplice, though. Although, the ambiguous commentary by the secret service earlier in the novel should have alerted me to that possibility. The main characters were blinded by their own feelings towards the villain. 5.0 out of 5 starsLoved this book. I have had this book for ages, so after reading and enjoying The Victory Garden and The Tuscan Child, I knew I had to read this one. The reviews I had read were varying, but I was not disappointed at all. It was a real page turner for me, with lots of excitement, twists and turns. The characters were totally believable, and I loved every page. Set in England and Paris during WW2. I couldn't put the book down, it had me from the first page. It showed British society at its true self, and how each class saw their place before the war and during and how secretive the government was during this time of crisis. This novel is very believable and is a credit to the author. Difficult to put down and at times quite exciting. Ive just finished reading this but feel that it ends unfinished , so much more story that could have been written to finish the book. You are left wondering about the characters and where the book could have developed their characters to. Well paced out with the twist not revealing itself unti the end however totally credible as well without being far fetched. Good historical context woven together with skill.